Of late my frustrations with our screwed up society have been exacerbated. More than ever before, media creates the stories that become our history and provides interpretations of what people say rather than merely reporting what they say. That which is presented as news is distorted in order to fulfill agendas and control our thinking. No wonder so many in the United States are amazingly nonchalant about who we are as a nation and where we are going in the future. As I have been watching certain television reports lately I am baffled when I know what I heard and what I understood about what has been said and then the talking heads reinterpret things for me to let me know what I was supposed to have heard and what it is that I'm supposed to think. This is a technique that is in essence mind or thought control. The U.S. government has been working on the collective brain of society for years now as certain influential groups have been whittling away our traditional thinking and twisting our history into the story they want us to believe about ourselves. My memory is fading as I grow older, but the powers that pervade the general belief systems of the American psyche in an attempt to pervert rational thinking in favor of emotions are interfering with my ability to remember the United States of America as a beacon for the world. The guiding light that once made this nation great may be dying out and many of the younger generations don't even realize it or for that matter care. I'm puzzled when something makes total sense to me and then the message bearers from the media tell me that I'm wrong and then let me know according to them what I am supposed to be witnessing and hearing. I'm not naming names or citing specific situations. I'm being enigmatic for a good reason. This is just my way of saying something without actually saying it. Obfuscation is a media tactic and a ruse of the politicians that seems to be the way we are often forced to use as our method of communication and now here I am also resorting to it, not in the way they do, but in the way I feel I must for reasons some of you might understand. If you don't understand then I see no reason to explain this to you. Besides, those who don't like me or what I'm saying will shape my statements to suit their own needs. Most everyone else isn't listening anyway. My most recent Battle featured the Kool and the Gang hit "Cherish" with versions by The Katinas and Pappa Bear. Knowing the nature of my voting audience, the winner of the contest was no real surprise. What did surprise me was how well the rap artist Pappa Bear actually did. I had even considered the possibility of a blowout in favor of the Katinas, but a handful of you kept that from happening. One thing for certain is that my vote would not have saved Pappa Bear although I thought the rap version was pretty good. Rap is not a genre that I normally listen to, but I like to keep an open mind about music and I can honestly say that there are some rap songs that I actually don't mind and in some cases I even think a few rap songs are quite good. However, I would imagine that my general preference in music will always fall in a direction away from rap. This is so in the case of this match-up and my preference is with the group The Katinas. Regarding my opening statement, you can make what you want of it. You can consider it an exercise in writing or another rant blogging in the wind. I tend to do some of both. When something strikes me strongly I tend to say more than "ouch" and then fade with a whimper, but then again what I say might be so veiled that I leave people guessing or just moving on to the next thing. I do what I feel like I need to do, but often not to the extent that some would think I should do. I guess that's my business though. And for now I do mean "business". Next Battle of the Bands will be on Thursday October 1st when I will get political by presenting one of the most well-known and perhaps oldest of political songs--a song that most of you probably wouldn't even associate with politics. You might be surprised. Do you avoid discussing what is meaningful to you for fear of offending others? Can you think of any recent blatant mind manipulations in the media? Have you avoided any genre of music merely because of your decision not to like any of it? I thought your opening was a provocative read. There are topics I avoid on my blog because I know I'm in the minority in my political views. I give kudos to you for being able to write about how you felt without and staying neutral. I don't have that gift :) And I agree with you. I watch the debates, understand what I've heard and then when it's reiterated by the news people I wonder if they watched the same debate I did. Elsie, I was aiming toward mildly provocative so thank you for noting that. I wonder if you really are in the minority regarding your political views or is it just in the circles you travel in life. We don't talk about things for fear of offending others so we often don't know what each of us really think. In an attempt to pervert rational thinking in favor of emotions - I think that sums it up very well. Alex, I've mentioned this feelings versus reason conflict at other times, but it just seems to keep getting worse. The funny thing is that the feelings of some groups are less important than others in the eyes of certain people. More and more I see this attitude of "your feelings deserve to be hurt with my attack on what you believe, but don't you even dare to try to hurt my feelings because my side is right." We're becoming very vanilla and far too PC. L.Diane, there are a lot of touchy people out there who don't even want to hear another point of view no matter how much sense it makes. Everyone needs to toughen up a bit and learn to listen to each other. I suppose media manipulation occurs everywhere, to some degree, although I'd like to think the news is reported "as is". Then again, I live in a different country, so I'm not sure what all that was about, Lee and to change history? How does that happen? Is there a mass rewriting of history books going on, somewhere? If so, that's absolutely deplorable! I don't delve into any controversial topics on my own site, but used to be an active participant in a forum which often got "down and dirty". I was in the minority with Pappa Bear as well, Lee and rap is a genre I never would choose, normally! Still, I like to keep an open mind and The Katinas didn't hold much appeal. Debbie D, I don't know about the rest of the world, but I've been seeing examples of history revision in U.S. textbooks a lot. Also many today are trying to discredit our predecessors for all the bad they did without putting things in proper context or crediting them for the good they did. You cannot judge the actions of the past according to the present. Glad you kept an open mind about the music and kept me from having a shut-out. It's been a very long time since I attended school, but I haven't heard of text book revisions here in Canada. That's SO wrong! As you said: "You cannot judge the actions of the past according to the present." Debbie, what I've been seeing about Common Core seems that they are playing around with the history of our nation and the world. The textbook excerpts I've found on the internet would upset me greatly if I still had a child still in school. I honestly feel like the world is going absolutely insane. How did we even get here? Valerie, how did we get where we are? Good question. Entropy maybe? Too much media influence? Ah Lee, you should know that a thinking people is a scary people. Robin, if the populace ever figures out what's going on then we will see major upheaval, but I don't think most people want to know much more than what TV tells them. Hi, Lee! I had a career in the news media and I can testify in support of what you wrote here. The weight a news story is given, it's position in the television newscast, radio report or on the printed page, is a subjective call made by people with their own beliefs and biases. The words used to tell the story, the tone of voice used by the reporter and the words the reporter "punches" for emphasis, also have the power to change the story's meaning or interpretation. We have more spin doctors in this country than medical doctors. My blog is about music and memories of good times in the past. I don't like to discuss politics or religion because doing so inevitably leads to people debating each other. A lively debate can be fun but, when when you are relying on the printed word alone, there is a greater risk of miscommunication, misunderstandings, hard feelings and the dreaded unfriending. For more than seven years I have maintained SDMM as a place where people can escape the harsh realities of the world, leave their political and religious differences at the doorstep, become united, think and act like kids again, dance, sing and have fun. Ugly debates are the opposite of fun. I am surprised to see that Pappa Bear did so well. I voted for the group, not to show off my eclectic taste, but because I genuinely liked their version better than the other. I used to think of myself as a person who doesn't like rap. I also told myself I don't like country music, classical, extreme heavy metal... the list goes on and on. The point is that I stopped labeling myself and limiting myself. I opened my ears and my mind to new things and the rewards have been great. 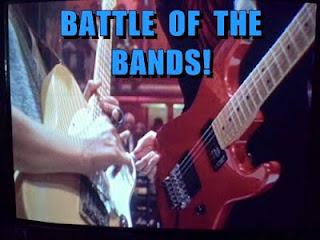 Thank you very much for broadening our horizons with your latest Battle of the Bands, good buddy Lee! Tom, I think you have effectively explained the methodology that subtly and sometimes not so subtle delivery of what's going on. Objectivity is difficult to find. Over the years my range of musical likes has expanded a great deal. Usually my biggest problem with rap is the crude language and the subject matter. I have found that some rap can be quite creative. Larry, we don't need a lot of things that are shoved in our face by government and media. We are getting thought control and I believe it will get worse. Larry, what does a Kardashian tweet say anyway? Or maybe I don't really want to know. I avoid country music like the plague. I love bluegrass, and some of the older country stuff of the 60s and 70s (Hee Haw era) but can't stand this new stuff. I also can't stand the new heavy metal that my stepdaughter is so fond of (I've tried, believe me, but it's horrible), and rap/hip hop. I stopped watching the news years ago....what I get is on my FB newsfeed or I will go to certain websites to see what's going on. I've just never in my life seen the disrespect towards a Pres as to Obama. I'm not a huge fan but he's been way better than Bush was. JoJo, history might deliver the verdicts on our presidents or maybe not. I guess the victors will decide what they want us to believe. Geoff, I don't know much about the political mindset where you are, but I think your country might eventually have similar concerns if they are there already. Mostly though I'm referring to how the media shapes our thinking thus potentially misinforming us and eventually misguiding us. I'd say we deserve better, but we deserve the leadership we settle for. Larry, and apparently the American people haven't deserved much in the recent decades. It's almost impossible to carve out the truth these days. Media=thought control. I think the 14 year old Ahmed boy who was arrested for "building a clock" and bringing to school is a prime example. The media ran away with it, making the kid into a media sensation. Ahmed talked about how his clock was his invention, how he built it, etc. Turns out, he didn't invent or build it at all. He just removed the insides from a 1980s digital clock and stuck it inside a pencil case. How is that an invention? Jay, yes! You've hit on one big bogus story of late--there have been many. What I've been reading about the boy genius Ahmed and his family background is a bit disturbing considering he was essentially turned into a media darling without any in depth research.. I was suspect from the very start when the story first hit the airwaves. He didn't invent anything at all. I think he was just testing the waters. If people bothered to think, thought control, as you put it, wouldn't work. But people don't think. Mostly, people just want to be told what to believe and, even, what to do. And both sides use thought control, so, from that perspective, it's rather a moot point. Andrew, most people are pretty complacent and would rather not think too deeply about serious things. You're right--it's much easier to just be told what to think and then go with that. Now we have specific news networks that cater to different preferences and people accept what their preferred channel says is the right thing. There is a constant battle for the control of the minds of the populace. The election cycles never end whether it be people or ideas or official ballot box voting or voting in some other way. Yes, yes, and yes. I have stopped following the news until my husband comes home late afternoon. Can't stand it. Somehow I feel like a turtle with my head pulled in, but it is the only way to keep from being chopped off. Last I heard Obama was inviting the new inventor to the White House to honor his ingenuity. Susan, I could come up with a very un-pc comment in regard to that White House visit, but for now I guess I'll keep quiet. There are much more deserving kids to invite to the White House in my opinion. I thought Lee what you wrote was right, there is much the same going on throughout the world. We are all intitled to our opinions and I , as mentioned totally agree with you. Yvonne, without sound knowledge it can be difficult to make sound opinions and unfortunately we get a lot of skewed information. I think that was a perfect description- of the Republican debate just past. If anyone REALLY went by facts and logic rather than emotion, we wouldn't have been looking for the winner, just laughing at all the losers. Certainly Trump wouldn't be the front runner, and Fiorina wouldn't have made the points she did standing up to him. I don't bring this up to debate- just to point out a great example of your post's great point. CW, the debate did get me to thinking a lot--or maybe I should say the debate analysis made me frustrated. I get kind of tired of commentators telling us what others meant to say or what they really said. I find it difficult to agree with many of those assessments much of the time. Birgit, I hear you and I am listening. I've gotten to the point where I don't express an opinion unless I'm sure the person with whom I'm speaking is of the same mindset as I am. I've seen too many people close to me get very upset with me because I say something they don't agree with and yet they think I should just listen to them without expressing my opposition so I just listen and stay silent. The problem that I'm bringing up here is that I often can't speak my mind without creating a big problem. I definitely watch what I say here on my blog since I don't really know what others feel and how they might respond to my opinions. So I tend to express myself in veiled enigmatic posts that don't say anything specific. Birgit, if this were a political blog or my sole purpose was to create controversy then I might go further than I do, but I have other purposes in blogging and that doesn't include alienating segments of my audience or provoking fights. My dad used to say people were losing their sense of float which meant tolerating different opinions or not letting. Disagreement end a friendship. I know my parents did not complain easily. There has been a growth in people who are difficult to just get their way. Say a growth because so many people still try to work fairly with others. Ann, people have to work together and yet so many skirt the real issues and avoid rational discourse. This is probably so little actually gets done and what does get done is because of people making too big of a stink about what they want. I try my best to avoid discussing anything potentially polarizing or controversial on my blog, for fear of alienating readers who might hold differently. I had a lot of such posts on my old Angelfire site, and got a number of angry e-mails and guestbook comments from people with the polar opposite views. I lost my entire site when one of these hot-button posts set off a mentally unbalanced woman and her sycophantic friends. I saved quite a lot of my posts, but sadly lost many others I couldn't find in archive and cache searches. I've gotten old enough to see the value of not burning bridges and starting arguments with people who hold much differently than I do. People should be able to be friends with and hold civil discussions with people of all stripes, just as a good writer should be able to write characters with religious, political, social, and cultural views which aren't exactly like one's own. Carrie-Anne, sometimes exchanging opinions is like going into combat. I'm not much of a fighter most of the time. Well, it wasn't a shutout. That's good. STMcC, I'm pleased with the outcome. 23 to 7. I thought the totals would be closer. Wow! I got rid of the television four years back, and haven't missed it. Dixie, TV can be frustrating, but so can life. I know exactly what you're talking about, Lee, and I'm 100% in agreement. I am so tired of manipulation by the media that I can hardly find a news report or media-controlled interview/debate/analysis that doesn't shock me to death with its inaccuracies, misquotes, clips taken out of context, and opinions presented as facts. The scary thing is, thought control seems to be working, and it's impossible to discuss alternative ideas with those who have been infected. Patricia, I think a good many people just accept what they're told on TV. Some people are hopelessly brainwashed whether by TV or not. I often wonder if anyone else remembers when the news was actually, factually and simply, news? Diedre, news was far more objective before cable TV and networks that catered specifically to certain groups. I remember those times and miss them. I'm typically a rather chill person and I don't usually rant about things at all (though, I can get sharp with people if they're being VERY ignorant). If I do rant, it's typically on my personal facebook page because those people, for the most part, KNOW me and will know how I'm meaning it, whereas random internet folks are always likely to take it the wrong way. Anyway, I chose the winner in your battle! I'm honestly surprised it wasn't a shutout! Madilyn, I was surprised at the receptivity of the rap version for the number who enjoyed it. I do tend to watch the television news although it often stirs frustration and a certain amount of anger within me. I think I've been relatively resistant to the manipulation of the media. I only watch about 15 minutes of the news because I find it can get depressing, to be honest. I do like to discuss things of importance to me, however, I make certain that the person knows I mean nothing personal by mentioning this to them straight up, and reminding them that it is my viewpoint, my opinion, etc. I will say, though, that if a person is hot-headed or volatile I will avoid discussing things that can become heated debates such as religion or politics. Linda, I've found that a lot of people don't want to hear opinions that don't match theirs. I think the problem is, many people are not hearing what other say, and rather, are just waiting for their turn to speak. We already know the ones that scream the loudest, have a tendency to become viewed as the Truth. I'll talk about anything on my blog - if the mood strikes. I've addressed controversial issues before. But I am thinking the time for talk is coming to an end. For the simple reason that no one is going to change anyone else's mind about anything. It's all just noise. Now, if you tried to change people's hearts, I wonder what a difference that might make. The whole world is groaning under the collective weight of ancient hurts so deep we are all suffocating under the burden. What we need is a Global sigh and deep breath. Maybe if we are still for a moment, and really see one another: hearts might begin to change. Rory, changing hearts is a nice dream, but I think it's unlikely to happen without good reasoning that leads first to change in mind. But like you say, many people may not even be hearing and certainly not listening to the other viewpoints. That reminds me: I should probably pick up a few onions when I go to the store today. Fixing beans for dinner tonight. Yeah, I love onions, too. And the website is pretty entertaining also. Wasn't sure if you knew of it, but a few of the comments reminded me of it. I hadn't been there for awhile. STMcC, I'm familiar with the Onion website. I never go directly to it, but I've heard it quoted and discussed frequently. They do put up some absurd pieces sometimes and I'm amused when people don't realize it's humor--sometimes the reactions from readers is funnier than the articles themselves. I don't consume a lot of information unless I specifically seek it out. That may be a positive or a negative. I don't watch or read the news, I don't keep track of trends, I don't spend time on social media. Really, I live in a bubble. It makes me happier as a person and content with my life, but does that make it a disservice to my nation? I wonder if I should feel bad about that. Loni, I don't know about disservice to your nation, but to be uninformed might be a disservice to yourself, your family, and your community. It's good to be aware of trends before they take you by surprise. Content based on complacency can be a dangerous state of mind. Lee, I hear you on your opening statement. NO ONE is going to make me believe things that I don't believe. But the news media is notorious at doing that. I'm a Christian who is going to speak her mind. YIKES. People sometimes take it the wrong way. I liked coming here and reading your words. Thanks for sharing. I agree with you, totally. Robyn, thank you for that encouragement. It seems like the TV "reporting" gets worse every day. Actually, I don't talk about anything meaningful for me at work, because my job operates on a stratospheric level of hypersensitivity explicitly designed to destroy careers and/or people for voicing an opinion that goes against the collective (shades of 1984). GB, I can imagine! I think I'd stay pretty close with my words if I worked in a government job. Personally, I think it would only be fair to put a rap version against another rap version of a song. There must be some around. Jeffrey, if I went rap against rap I'd have to take the rap for too much rap. Well, that wraps up that subject. Hello Mr B . . . . I hope you know that although us British think you are a bit of an odd lot in the USA in general we sort of like you. In general you appear to be a friendly bunch, but you do have a weird political system. And us Brits have never got our heads round why you all have so many guns. Rob, we have the guns so we can come to the rescue of the countries who don't have enough. I had a professor years ago who caught me reading the newspaper in class and he roared, "The only thing worth reading in the paper is 'Pogo'!" The older I get, the more I'm inclined to belive him. John, the lack of any value in the newspaper is the main reason I cancelled my daily subscription to the Los Angeles Times. Now I only get the Sunday paper for the crossword puzzle and the coupons and even those are starting to get bad.